← How to combine multiple images to single PDF? Image to PDF Converter can help you insert image to PDF, which includes GUI version and CMD version that has been designed to help users convert image files to PDF files with specified targeting properties in Windows platforms. For more details, you can keep reading this article to know more about them. 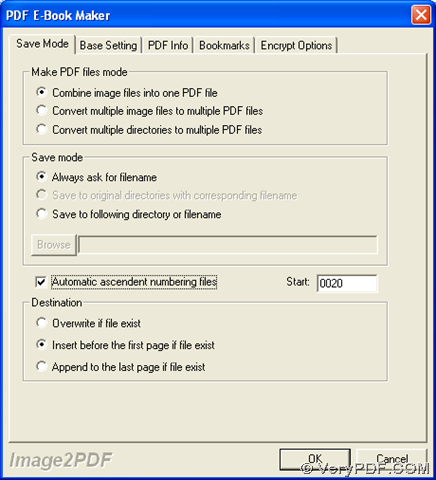 Then, you can continue to use these two versions of Image to PDF Converter on your computer, also if you want to know more of Image to PDF Converter, please go to its homepage online at http://www.verypdf.com/app/image-to-pdf-ocr-converter/index.html. You need to click “Add Files” on this interface, then select one image from dialog box of “Image2PDF” > click “Open”, so this imager can be added for this process, which can be shown as its path in processing form. And you can click this path so that this image can be shown on preview panel of GUI interface. Then, to insert this image file to PDF file in the condition of the existing of one PDF file, please click “Setting” > click “Save Mode” > click radio of “Insert before the first page if file exist”, then please click “OK” there so that this setting can be saved. When program jump back to main GUI interface, to select one folder for saving this PDF file and produce PDF file, please click “Make PDF” on GUI interface, then select “Convert one file into one PDF file” on dropdown list, then choose one targeting folder in dialog box of “Save As” > click “Save”, finally, this image file can be inserted to that existed PDF file after a few seconds, and you can preview it on your computer. Img2PDF stands for path of “img2pdf.exe”,which is used to use CMD version of Image to PDF Converter through calling “img2pdf.exe”; [options] reprensents parameters typed which are optionally used for editing properties of PDF; <-o output> is an essential combination, which includes parameter “-o” that is used for producing PDF file, and targeting path of output, which is typed for saving PDF; <images> is representative of source path, which is typed for adding image for this process. –p 0 is parameter with value “0”, which is used to insert image into PDF file before first page; f:\target\output1.pdf is targeting path of existed PDF file named “output1” on your computer, which is used for saving targeting PDF file. At last, to generate new PDF file, please click “enter” in command prompt window. Then, after a while, new PDF file can be produced into targeting folder.